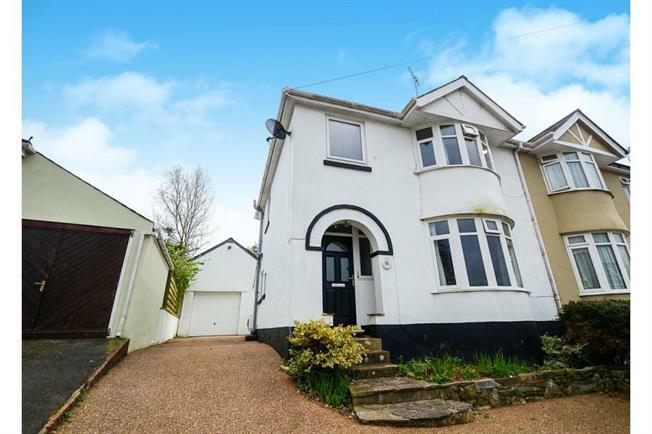 3 Bedroom Semi Detached House For Sale in Totnes for Guide Price £360,000. Situated in a great tucked away spot within a short walk of Totnes town centre you will find this delightfully spacious three bedroom 1930's semi-detached home. The property being slightly elevated has great views and is ideally suited to couples or families seeking that extra space. There is even a studio area above the garage which would be ideal as an office or childrens hideaway offering great potential, own driveway and a lovely low maintenance terraced rear garden. This is a true gem !! Part Double Glazed Windows to the front and part double glazed door. Staircase to first floor, radiator, understairs cupboard, exposed wood flooring, picture rails, meter cupboard. Double glazed bay windows to the front aspect, TV point, Radiators, picture rails. Double glazed sliding patio doors to the garden, radiator, picture rails, TV point. Double glazed windows to rear and side aspects, ranfge of fitted wall and base units, one and half sink unit and single drainer, work tops, part tiled walls, fitted electric oven and gas hob, plumbed for washing machine, space for fridge/freezer, tiled floor, part double glazed door to garden, wall mounted gas combination boiler. Double glazed window to side aspect, picture rails. Double glazed windows to front aspect with far reaching views, radiator, feature cast iron fireplace, range of fitted wardrobes, picture rails. Double glazed windows to rear aspect, radiator, picture rails, range of fitted wardrobes and drawers. Double glazed window to front aspect with far reaching views, radiator, loft access, picture rails. Double glazed window to rear aspect, panelled bath with shower over, pedestal hand basin, low level WC, fully tiled walls, heated towell rail. Walls to front and sides, shrubs. Part paved and part gravelled terraced garden with steps leading up to a wood deck sun terrace, walled gardens, shrubs, outside tap, shed. Up and over door, power points, light, double glazed windows to the side and double glazed door leading to the side garden. Separate cloakroom with low level WC, hand basin with tiled splashbacks. Stairs lead to the Studio area above the garage. The studio has a double glazed door opening onto the wood decked sun terrace, double glazed velux window, power points and telephone point.